Poppy's future may be full of promise, but there's a hole in her past and it's getting in the way. On her family tree there's a grandma called Sorrel Golding, but is she alive or dead? TRACES is about the power of the past, about damage and healing - or love, ghosts and donkeys. In Sue Hampton's eighth novel for Pegasus, you will find her love of flowers, peace and justice, music and history. It is also a tribute to Paul, the father she loves as much as ever, who was once, long ago, a young and very brave conscientious objector. Such a good read from the moment you start! Not only a winning book, but a book for our times, as world peace is declared, starting in children's bedrooms, then family rooms, then school rooms, board rooms and cabinet rooms! This book deserves to win. I have read all of Sue's books and met her several times. She successfully engages the interest of young readers and communicates her passion for literature and words. This novel shows her sensitive understanding of children and her ability to engage imaginatively with their thoughts and feelings. A most satisfying read! Sue, I am very impressed with the extract. Definitely, this is going on my Christmas shopping list! Thoughtful and compelling work! Inspired writing talent. Another great book Sue - congratulations! An author from a small publishing house who deserves wider readership. Well done for doing it the hard way. lovely story - World War I holds such a fascination, particularly for young people. Engaging writing, makes you want to read more. I know she is very popular with the girls at my school! This is a wonderful story, gently and movingly told. I was hooked from the first page to the last and am now genuinely sorry to be putting the book down and leaving its well-drawn characters behind in some way. I doubt very much, however, that they - or this story - will ever fully leave me. I was very happy to give this book to my grandaughter for Christmas. A compelling, wistful yet powerful book. Immediately drawn into the story by the first page. Beautiful writing. You convinved me with this amazing book and your amazing author talk. Keep up the amazing work. Well done Sue, Your book looks amazing. Sue came along to our writers group in Coventry and read an extract from this book, it was really moving and very well written Good Luck Sue! This story is so refreshing, it balances the minds of our modern day children reminding them how important family and friends are and that we all thrive on CARING! My 10 year old coudn't put down The Waterhouse Girl and couldn't wait to sepnd her well earnt pocket money on this. Fantastic Sue - Well done again!! Beautifully-written, with style, insight and humour, all the threads are woven into a powerful and satisfying read that also makes you think about things. A book to make you think about and feel the life you live. As always a wonderful book to add to our collection written by Sue- Well done.- Highly recommened. A deserved accolade for an author with a different take on children's literature. The book has a nice, warm feeling about it. It is obvious that a lot of research was carried out about donkeys before writing this book. I thoroughly enjoyed reding this book. Well-written story with a theme that's bang up to date, reflecting the natural inquisitiveness all children have about where they come from/how they fit into the broader picture of the family and with a mystery to boot. A brilliant book from this great author - a real page-turner ! A beautifully written book. Thought provoking and gripping, Sue handles difficult subjects in a sensitive way. It is wonderful to have writing of such quality for children. Another great book from Sue Hampton ! Imaginative and thought-provoking, an enthralling read. Well done Sue. We all loved it! My daughter and I have just read the frist chapters of the book and we decided immediately that we wanted to go out and get it. A truly inspiring read; Flares is written with sensitivity, intuition and creativity. The language is superb in conveying a depth of emotion that gives substance to this amazing children's book. This is a thoughtful book and I found myself rooting for Poppy all the way through. Great book for children and adults alike. Another excellent book by Sue. My daughter and I enjoyed reading this charming book. Lovely book. Great for older and younger children. A great read! Congratulations to Sue Hampton on this finely produced work. A fine story. 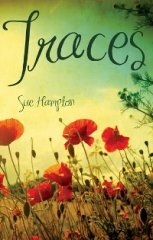 I found Traces a very touching story, finely written by Sue Hampton with great love and understanding of the children and the inner child of any of us. This is a lovely book and totally deserving of a vote for the PBP. Sue Hampton is a magical author. Another great read from Sue Hampton, insightful and human. Great quality reading for KS2 where so much of the available literature tends towards 'teen fiction' which is not always appropriate for good readers of this age group. A welcome alternative and believable characters with spirit rather than attitude. I liove the this book it is AMAZING!!!! This is a really interesting, not to mention well written, tale. Very much deserving of such a prize. I found Traces a charming story, well written for its' targeted audience. This is a magical book. It's full of love, family, secrets, wisdom, transformations, acceptance and growing up. The story unfolds effortlessly and if you love donkeys, you'll grow a fast affection for them in this story. Set against the natural world in a small community, it's a perfect balance of humanity and nature interwoven and will captivate the hearts of readers. The characters will linger in your imagination after the story is finished.